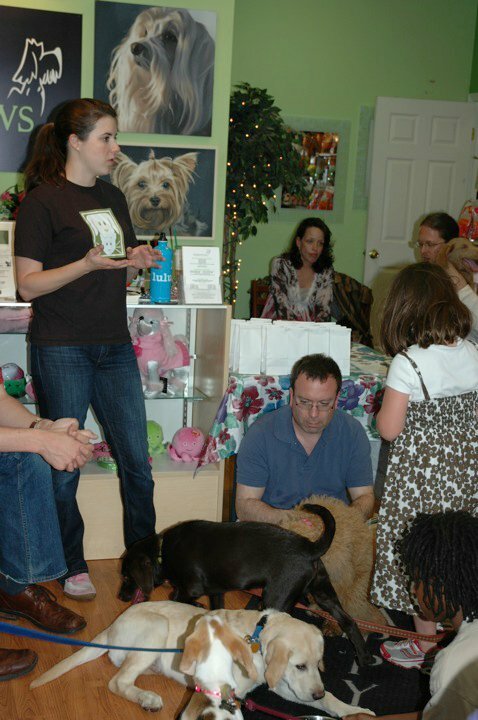 The first Polite Puppy class was this past Sunday at Happy Paws and I feel that it was a big success. There was an environment of controlled chaos as puppies leaped and twirled at the end of their leashes trying to play with each other. Once everyone settled down we started by discussing behavior modification (my favorite topic) and that for everything a dog wants in life they must sit and wait for you to offer it to them. We went over how to teach sit, stay and look at me, these are the essential commands that every dog should know. I also encouraged owners to practice restraining their puppies at home which will make the puppy's trip to the hospital much more enjoyable. After covering behavior we moved on to my recommendations for how to keep your dog happy and healthy. I demonstrated the appropriate use of Gentle Leader Head Collars and the Gentle Leader Easy Walk Harness for those puppies that drag their owners around. One of my goals with this class is to banish Prong collars which cause me to wince every time I see one on a dog. In my opinion these horrible contraptions are cruel, painful and ineffective. Without appropriate training most dogs eventually get used to the sensation of metal spikes poking into their necks and continue to drag their owners down the street. I touched on nutrition and the importance of feeding one's dog a high quality food appropriate for their dog's lifestyle. What owners need to be aware of is that many of the boutique brands of dog food are formulated to be "all life stage diets" which essentially means it is puppy food. Many people feed these high calorie diets to their couch potato dogs and are confused when they start to gain weight. We also discussed the pros and cons of raw diets and the health risks associated with them Finally I went over toys I like such as the Kong and how chewing on a tennis ball will ruin your dogs teeth. The puppies were definitely exhausted when they left and I hope the owners took away some helpful tips on keeping their new family members happy and healthy. The next Polite Puppy Class will be Sunday, May 23rd. What kinds of toys are non-destructive for their teeth? My chihuahua LOVES to gnaw on bones but I'm scared they may mess up her choppers! I have an Easy Walker harness for Windsor. It was working well. Now it does not. Windsor listens most of the time. However, when he sees someone he knows, especially if that someone has treats, he pulls. The harness no longer turns him around to look at me surprised. Do I need a new harness? What do you recommend? I have tried carrying my own treats to deflect to no avail.